Believe the hype. This movie really is both thrilling and smart in ways that combine horror, drama, thriller, and even sci-fi. A truly excellent movie, this one blends genres seemlessly by taking the best they each genre has to offer. 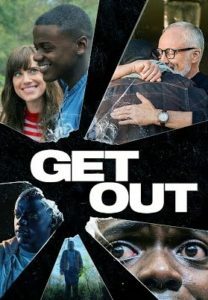 Like Cabin In The Woods, (which also featured the great Bradley Whitford,) the mix of comedy and horror work hand in hand. There’s an incredible uncomfortable factor at play here when Chris goes up north with his girlfriend to meet her family for the weekend. What starts as some bizarre behavior turns into hypnosis and mind bending. The movie even manages to dive into sci-if by the end, without making it seem out of place. Everything works about this movie, including the atmosphere, the feelings of paranoia and the perfect scares. 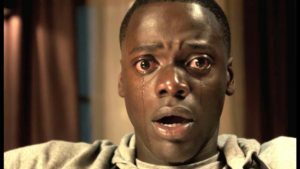 Get Out is an absolutely fantastic movie. It’s a movie that is very good when you see it. But then it grows on you and gets you thinking even more, and suddenly you realize that with this movie, they really did hit on something clever. They created an experience that feels familiar on multiple levels, and yet what’s going on under the surface is deeper and darker than one would ever expect. The initial premise is very simple. A black guy is going over to his girlfriends house to meet her family for the very first time. Now, by going over to her house, I mean the two of them are taking a drive up north, leaving the city for the suburbs, and are going to be staying over with the family for the weekend. Still, this is basically a Guess Who’s Coming To Dinner kind of setup, and it works. Especially with the humor mixed in, like the girl (Rose,) telling the guy she is bringing, (Chris,) that her father will most definitely be talking about how much he liked President Obama, and would have voted for him for a third term. Before we get to any of this, however, there’s a fantastic opening scene. A young black guy is walking down a neighborhood street at night talking on his phone. Suddenly a car pulls up and stops right next to him. Nobody gets out. The car just sits there, and when the guy turns and walks the other way, we think maybe everything is cool. But then we see the car again, still in the same spot, only this time the passenger door is opened. The guy on the street doesn’t know what to do, so he keeps walking away, trying to ignore the situation. That’s when someone comes running right at him, sedates him with a needle in the neck, and then drags his limp body to the car. This scene works on all in all kinds of levels. It works because we don’t know who these characters are, but can gather that this sort of thing has probably happened before. It works because we never really see the attacker until it’s too late, (and even then, we never see his face.) So we want to know more. It even works in making us wonder if someone else was driving the car, besides the attacker’s, since it’s the passenger door that’svopened. We leave the scene wanting to know more. Who did this and why? The answers are coming. Back to the couple driving up north to meet the girl’s family. They have a couple of bumps during their drive. First, there’s a cat who comes flying out of the woods, right as they are driving by. Apparently it was a deer, but boy did it look like a cat. Not just that, but it seemed like a cat hitting their windshield and yet upon inspection it was really a deer hitting their side view mirror and headlight. Then an officer comes to fill out a report and wants to check Chris’ ID. Rose gives the officer a hard time, claiming it’s racist to demand Chris’ ID when he wasn’t the one driving. Chris let’s her do all the talking. And then they arrive at the house. The drive right up to the house is strange, with black people who work for the family, (the house keeper and the gardener,) standing in silence watching the car drive by. The gardener holds his hand up motionlessly. After the couple goes in the house, we pull back to watch the gardener standing there, watching them go inside. Then later on, when the couple goes to the yard to sit at a table and drink some iced tea, the house keeper accidentally pours tea on Chris and Rose’s mom tells the woman to go back inside and lie down. Clearly there was something going on inside of the housekeepers head (we get to hear the voices, but can’t make out what they’re saying,) when she does this. It gets even better. The tour that the father gives Chris of the house is loaded with subliminal meaning. From the line about candlesticks from Bali, where the father says, “it feels amazing to be able to embody another persons culture (not another culture, but another PERSON’S culture,) to a line about some mold, every line counts. With that one the father says there’s some black mold over there that he needs to cover up. Just substitute the words culture and mold out for other words and you realize maybe there’s s little more to what he’s saying than meets the eye. During Chris’ first night with the family, he sneaks downstairs to go out for a cigarette, and is discovered by the mom. She has him take a seat and hypnotizes him. It’s something she does for patients. She hypnotizes him into not wanting a cigarette ever again, but it’s so dramatic that he ends up frozen in place, with tears streaming down the sides of his face. The situation is more than just dramatic though. It’s kind of scary. Especially when Chris goes into that hypnotizes state and the movie presents it like he’s falling lifelessly through a hole into space, and the mother is looking down at him, through the hole, in a place he can’t return to. This reminds me of the scene in Trainspotting where Mark falls into the floor and it becomes a sort of red coffin that he can’t climb out of. When Chris wakes up in the morning, he feels great. His cravings for a cigarette are long gone. And it’s just in time for the parents’ big party. Chris meets a whole ton of people, and most of them are pretty friendly. When he snaps a photo of a block person there, (the guy from the opening prologue,) all hell breaks loose and Chris finds himself being stacked by a guy who screams, “Get out.”’Something is definitely up, and Chris spends the rest of the movie figuring out what. The surprise twists work here, and the revelations are fantastic. The movie doesn’t just go the horror route, but also dips it’s toes into the pool of sci-if. The result is fantastic. This one just might end up being considered a modern masterpiece that we will remember for years to come.